There are so many delicious varieties of cookies, making it hard to choose a favorite. But in my heart of hearts, I know that peanut butter cookies are, and have always been, my top choice. 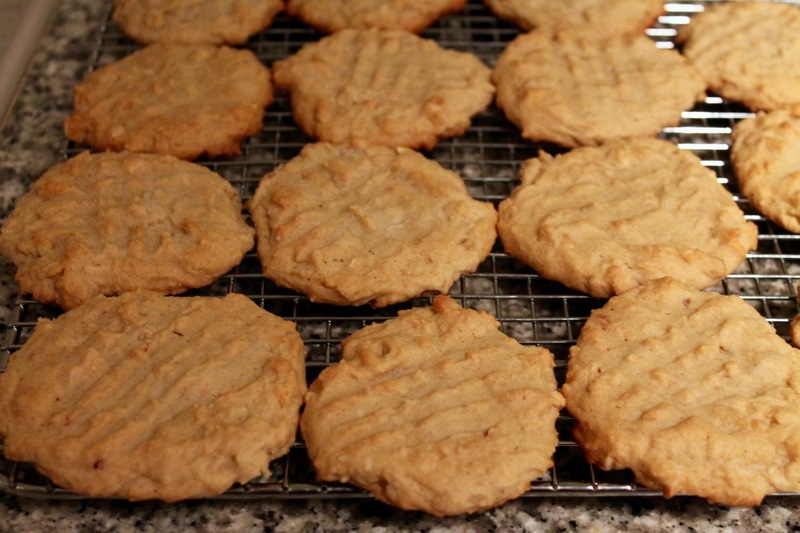 For years, I've relied on the America's Test Kitchen recipe as my standard go-to for peanut butter cookies, which I make for the holidays pretty much every year. This year, I wanted to try something different, so I turned to my cookbook shelf to see what I could find. The New Basics Cookbook, the 1989 classic by Julee Rosso and Sheila Lukins, had what I was looking for. 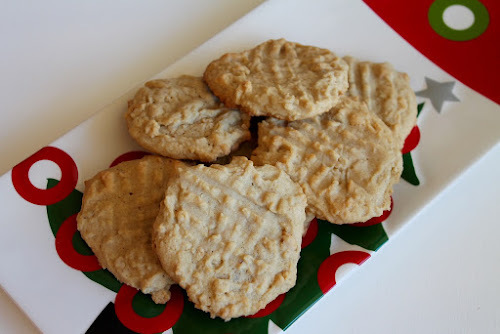 Their peanut butter cookie recipe includes maple syrup and no added salt except for what's in the peanut butter and the peanuts if you're using a salted variety. The maple added a nice flavor and I didn't miss the extra salt. I experimented with the look of these cookies a bit. Traditionally, peanut butter cookie dough is rolled into balls and then flattened with a fork, making a clean, round edge and that characteristic hatch-mark pattern. Curious how they would look, I spooned the dough on the baking sheet without first rolling it and added the hatch-mark and also left a few "un-hatched." I like the rougher look and the results were just as tasty. 2. 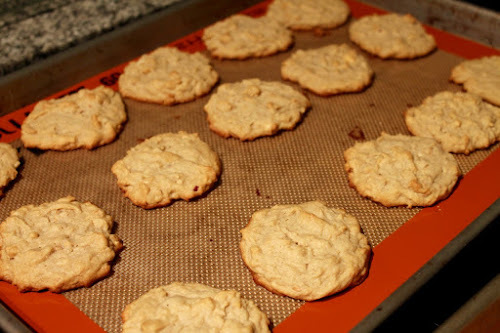 Combine butter, peanut butter and brown sugar in a bowl of a stand mixer and beat--first at a low speed and then at a high speed--until light and fluffy, about 5 minutes (alternatively, combine in a large bowl and beat with a hand mixer). On low speed, beat in the maple syrup, egg and vanilla, then increase speed and beat until combined. 3. In a separate bowl, whisk together the flour, baking soda and peanuts. Add to the butter-sugar mixture and slowly beat until combined. 4. 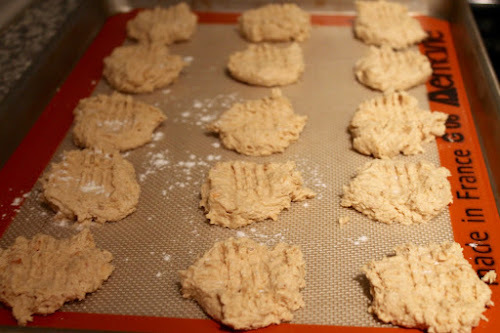 Spoon the batter in rounded tablespoonfuls (about golf-ball size) onto baking sheets lined with parchment or a silicone baking mat, about 2-3 inches apart (aim for about 12-15 cookies per sheet for a standard-size baking sheet). Flatten slightly with a fork dipped in flour (or don't, as it really isn't necessary, it just looks cool). 5. Bake until lightly browned in places on top and around the bottom, about 8-9 minutes. 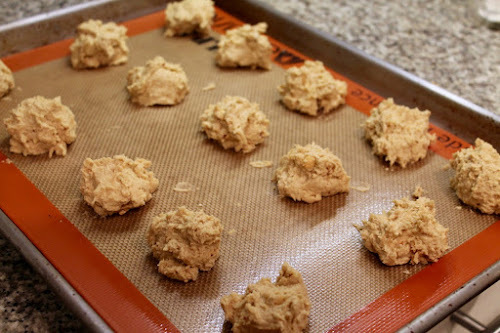 Remove from oven and allow to cool on the sheet for about 5 minutes, then transfer to a wire rack to cool completely.